In a small pot, combine the quinoa and coconut milk. Bring to a boil, then reduce the heat and simmer, stirring occasionally, until the quinoa has absorbed the coconut milk, about 15 minutes. Pay attention as the quinoa is done cooking and stir more frequently to prevent burning. Meanwhile, in a large nonstick skillet, heat the coconut oil over medium-high heat. Add the apple slices and cinnamon and toss to coat the apples in the cinnamon and oil. Add the water and cook, stirring frequently, until the apples are tender and golden, about 5 minutes. Remove the pan from heat and stir in the orange marmalade. To serve, spoon about 1/2 cup of quinoa into 4 bowls. 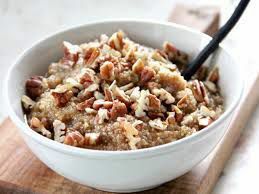 Divide the cinnamon-orange apples among the bowls and sprinkle the top of each with 1 tablespoon of chopped pecans.